Inaugural 2013/14 Men`s European Champions League`s match belonged to 2008 winner Niederosterreich who beat ten-time champion Borussia 3:2. The game was held at Schwechat and it was the first victory of Austrian team against Dusseldorf`s Lions in their last seven meetings. World`s. no. 71 LEUNG Chu Yan was the man of the match, winning two games, against Patrick BAUM and Kamal ACHANTA. Borussia played without two leading players in previous years. Christian SUSS` condition is well known (because of injury received in March he`ll be out of the team until new year) while Timo BOLL got a slight shoulder strain in his left shoulder last Saturday against Grenzau in Bundesliga`s Round 1. The club didn’t want to risk with him. Indian ACHANTA (world`s no. 56) had a nice debut in Borussia`s jersey on European scene, beating experienced CHEN Weixing (no. 42) in straight sets of opening game. Indian saved one set ball in second set (9:10) which was the crucial moment. Almost same situation was seen in third set. Niederosterreich`s LEUNG Chu Yan defeated again Patrick BAUM in their second MECL meeting (last season 3:0), now in five games. German was two times one set up, managing to save one set ball in fourth set (10:10) thanks to good serve. But, LEUNG did one excellent move to win that set: he twisted his body, touching the floor with his left hand and from that position he managed to level on 2:2 in sets. In fifth set Hong Kong`s player was unstoppable, having five point distance from the start. Two youngest players met in third encounter. The winner was Stefan FEGERL who missed several set balls in opening set, as Ricardo WALTHER used that chance to win 30 points long set. In last fourth set both had some set points, but host did the final shot. Patrick BAUM finally beat CHEN Weixing who didn`t fit to him. They met one another sixth time in last six games between Niederosterreich and Borussia and Austrian won previous five. Now, German needed just three set, while host missed his chance in second set when he led 9:4. 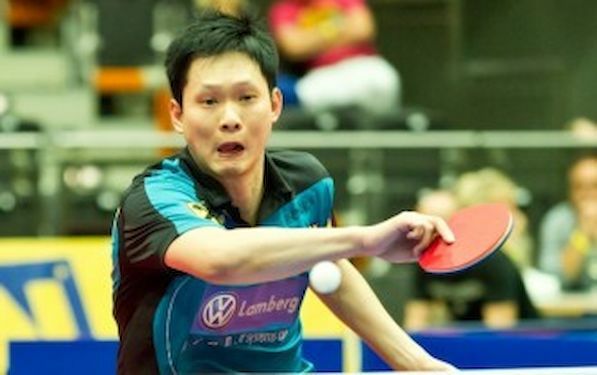 LEUNG overcame ACHANTA in decisive clash to bring long waited win for Niederosterreich in Men`s European Champions League Classic.